Geek's Guide to Britain As I approach the Wales-England border, the rolling Herefordshire countryside sharpens into steep hills and narrow valleys. Powys is a county covering a quarter of Wales, but it is home to just 133,000 people, making it the least densely populated area of Britain south of the North Yorkshire moors. Limited population means few buildings and roads and therefore lights – with their annoying visual pollution. It's therefore a perfect place from which to watch space from a telescope and look for potentially planet-killing asteroids. 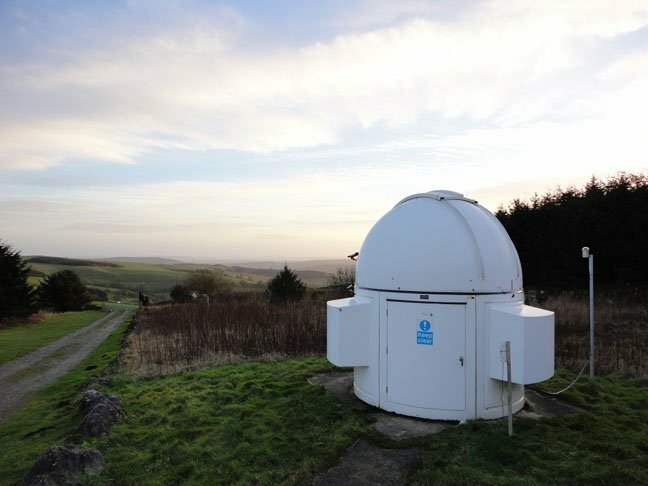 I’m travelling to a privately run observatory dedicated to tracking Near Earth Objects (NEOs): it is known on local signs as Canolfan Gwylio’r Gofod – The Spaceguard Centre. Arguably the best, last hope of Britain and the world, Spaceguard is the inspiration of a single man: an ex-army officer specialising in surface-to-air missiles called Jonathan Tate. It also turns out to be a fun and absorbing tourist attraction for all the family. Once over the border it’s not long before I’m in Knighton – a rare town in the Powys expanse, where I find a brown sign that directs me to the site. After several minutes’ ascent and just as the single-track lane levels out, another sign directs me on to a farm track. Through a farm gate, the summit reveals a collection of red-brick buildings topped off with a lopsided metal cylinder, used to house a large telescope. At 417m (1,368 feet) above sea level, the Spaceguard Centre would be a fine place to survive the tsunami that would result from a sizable asteroid hitting the Atlantic, and – given its remote location and good sightlines downhill – a decent place to hole up for the breakdown of civilisation which would probably follow, even in Wales. The aim of the Spaceguard Centre is to help stop near-earth objects (NEOs) hitting Earth in the first place: Spaceguard in June participated in Asteroid Day, a global project to raise awareness of asteroids. This year’s event took place on the anniversary of the 1908 Tunguska event, the largest asteroid impact on Earth in recent history. Asteroid Day came with a declaration signed by some of the big names of international space and science calling for greater technology to track near-earth asteroids. Among the signatures were those of Professor Brian Cox, Canadian ISS commander astronaut Chris Hadfield and Jill Tarter of the SETI Institute. As part of Asteroid day, Spaceguard ran a free open afternoon on June 28, but I dropped in before that and was hosted by Tate. The tour is basically a 90-minute interactive lecture by Tate, armed with props including a planetarium, real meteorite samples and a 2.5 ton telescope. Visitors can ask questions as and when they like: if anyone knows the answer, it is likely to be Tate. He walks us around the centre’s well-equipped exhibition room, using its items to make things clearer. He starts by talking about the formation of stars and planets with the help of a model solar system and a few minutes in a small planetarium, then zeroes in on asteroids and comets – bodies small enough to be wrenched out of a regular solar orbit. He explains that 100-150 tons of material hits the Earth’s atmosphere every day: mostly dust, some of which causes shooting stars. Tate is interested in the bigger stuff that either falls to Earth or explodes – or “pops”, as he cheerily puts it – in the atmosphere. The NEO that burnt up over Chelyabinsk in Russia in February 2013 was around 20 metres across and popped 30-45km up, but it still injured 1,600 people by causing a shockwave which blew out windows. If the Tunguska event – the larger NEO that exploded over in Siberia in 1908, levelling hundreds of square kilometres of forest – had taken place over south-east England, it could have demolished London and damaged buildings across the UK. A prehistoric NEO turned 300 sq km of Middle Eastern desert to glass. To illustrate all this, there is a glass case of off-planet samples, which Tate shows off to wide-eyed children and grown-ups alike.